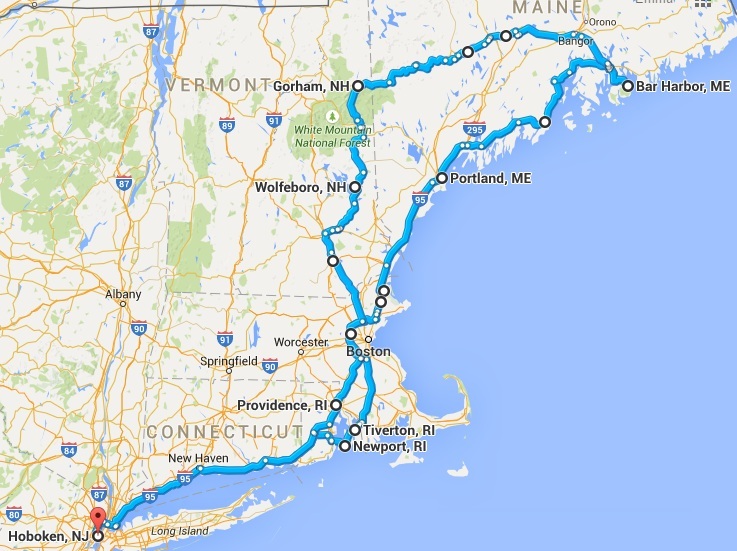 Another holiday, another roadtrip; and this was our longest yet. Annoyingly I forgot to check the odometer before we set out, but having put the route into the map I think we drove around 1200 miles. Spanning 10 days, the purpose of this trip was three-fold – to check off the last of our unvisited New England states (Rhode Island and Maine), to enjoy some less aggressive summer weather, and to spend time outdoors – and I’m delighted to report we succeeded on all fronts. Each location we visited was quite different to the others, so it’s impossible to choose a single highlight from the trip, and overall we had a lovely time. Particularly memorable moments include touring the Vanderbilt’s extravagant summer mansion in Newport, taking a boat trip out of Portland, lobster rolls in Rockland, beautiful scenery in Acadia National Park, the huge sense of achievement (and relief) after hiking Mount Washington, and the spectacle of WaterFire in Providence. Edited to add: I’ve been really lax about putting specific dates on most of my posts, usually feeling that the WordPress publication date is sufficient. However, as there’s likely to be a delay before I get this trip written up and posted, for future reference the travel dates were Friday 7th to Sunday 16th August, 2015! This entry was posted in Exercise, Exploring, Food and drink, Holidays, Travel and tagged Downeast roadtrip, Maine, New Hampshire, Rhode Island by Emma Davidson. Bookmark the permalink.